The family home - 95 Gloucester Road. Albert was born on 26 January 1887 and was the youngest child of Edwin Thomas and his wife Mary Jane (née Tennant). The couple had a total of six children, but only five survived to adulthood. It is thought that the sixth was Rose Caroline who died, aged four, in 1879. Albert’s adult siblings were Ellen Clara (born 22 February 1877), Francis William (22 June 1878), Henry Edwin (17 April 1880) and Celia Marion (26 June 1882). The children were educated in Newbury schools apart from a break in 1886/87 when the family left the town to an unknown destination for a few months. 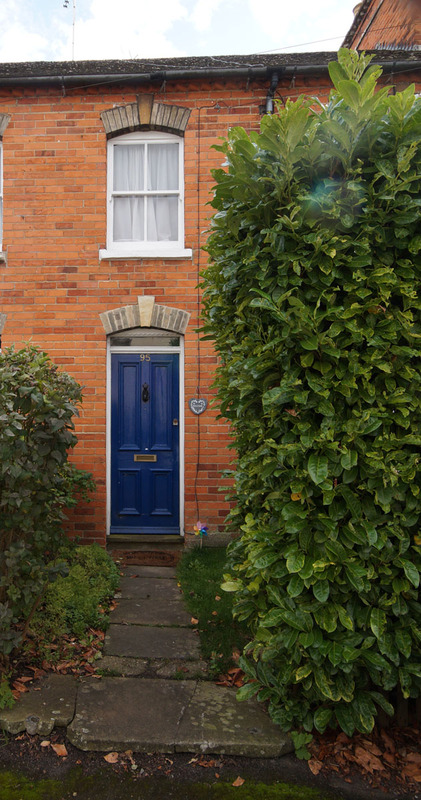 On their return to town the Thomas’ lived at 1 Sarum Cottages, Enborne Road; in 1890 they moved a short distance to 3 Gloucester Terrace, now 95 Gloucester Road. All five children attended St Nicolas’ School in Enborne Road, though it was split into Girls and Boys schools. St Nicolas educated children from 8 to 14 (education was compulsory up to age 12); prior to this age Albert attended St John’s Infant School in Newtown Road. When he left school he began work for as an apprentice to a local grocer; in doing so he was following in the footsteps of his brother Henry – and not in those of his father, Edwin, who was a house painter. Henry and Albert both left Newbury to pursue their careers; by 1911 Albert was working in Warwick. Long Itchington, Albert married in this church. 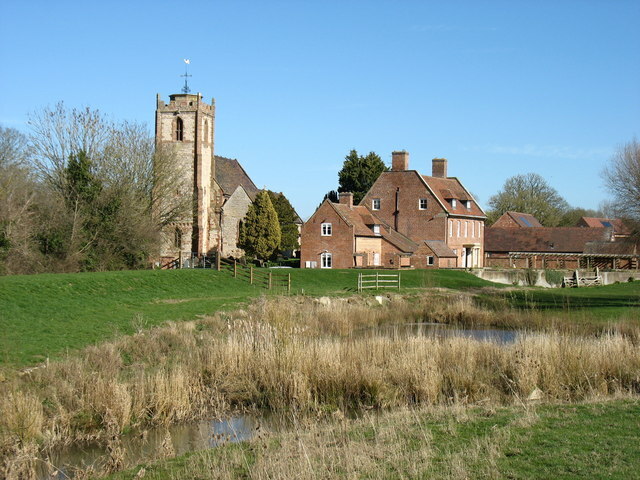 On Wednesday afternoon the wedding took place at the Parish Church of Miss Gladys Whitehead, eldest daughter of Mr and Mrs Frank Whitehead, of Long Itchington, and Mr Albert Edward Thomas, youngest son of the late Mr Edward [sic] Thomas and Mrs Thomas, of Newbury. The bride’s dress was of white poplin de soie trimmed with Brussels net and pearl, and she wore a white tulle cap wreathed with myrtle and white heather; she carried a shower bouquet of white heather, white carnations and lily of the valley. Miss Whitehead was given away by her father, and was accompanied by the following ladies as bridesmaids: The Misses Alice and Margery Whitehead (sisters), and Miss Beatrice Bennett (friend). They were dressed in biscuit coloured voile with caps to match and carried shower bouquets of pink carnations. All the bouquets were gifts of the bridegroom. Mr Sutton Russell acted as best man to Mr Thomas. The ceremony was conducted by the Rev W E Ellis, Vicar of the parish, and was witnessed by a large congregation of friends and parishioners. The wedding breakfast and reception afterwards took place at the residence of the bride’s father and mother, Mr and Mrs Frank Whitehead. Later in the day Mr and Mrs Thomas left for their new home at Edgley, near Whitchurch, Salop. Both were the recipients of many beautiful and useful presents. Edgeley is a village a mile from Whitchurch, where Albert became the manager of the local branch of the Star Supply Stores in High Street, Whitchurch. Star Supply Stores was a national chain of grocers, which was later bought by International Stores. On 15 December 1915 the couple had a son, Peter, but the happy event must have been marred to some extent by the awareness that Albert would probably have to go to war – the introduction of conscription was imminent. Sure enough Albert was conscripted into the army in late 1916 (probably in early December) and was posted to the King’s (Liverpool Regiment). Sadly his service record was lost in a fire in 1940 that destroyed around 70% of such records; without it his time in the army is difficult/impossible to explain. It seems that he did get some leave, probably a few days of embarkation leave, which was given, when possible to men about to leave for a war zone. A result of this leave was the birth of his second son, James Edwin, on 19 October 1917. As a dating methodology it is not ideal, but it suggests that Albert may well have crossed to France in late February 1917 (or soon after). 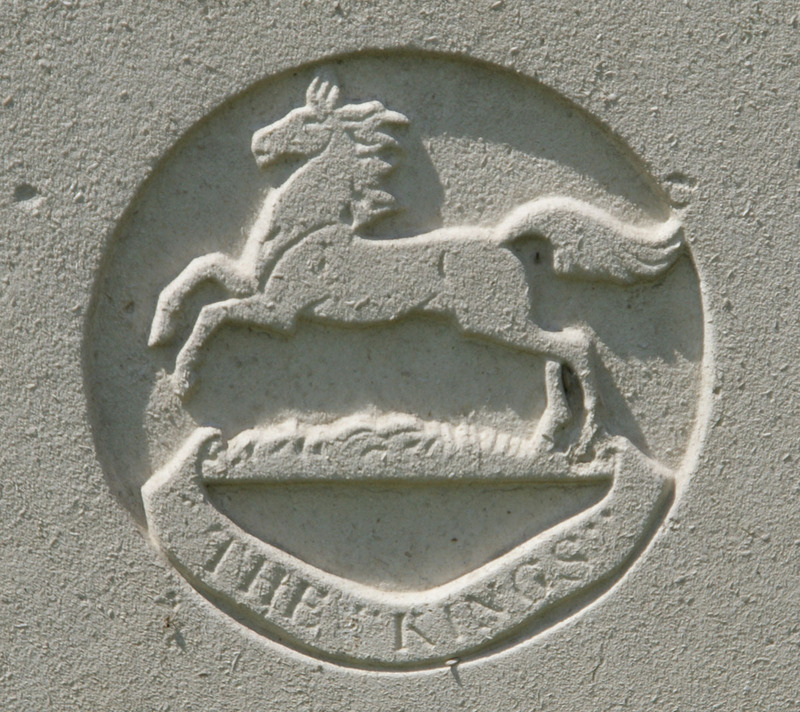 The regimental badge of the King's Liverpool Regiment, as used on CWGC headstones. In the Medal Roll for the King’s he is shown to have spent some time in a theatre of war as a member (No 48410) of the 81st Company of the Labour Corps. This company was formed in 1917, when the Labour Corps was created, and was previously the 17th Labour Company of the King’s. So it seems likely that Albert was deemed unfit for frontline duty and hence was posted to a labour company, which would support the fighting troops by digging trenches, repairing roads, etc. Then, at some point, he was transferred into the 1st Battalion of the King’s – a frontline, fighting unit. Either medical standards were lowered or his fitness had improved (entirely possible when a shop manager becomes a labourer and gets a lot more exercise). On 20 November 1917 the British unleashed a new form of warfare, using massed tanks for the first time on the opening day of the Battle of Cambrai. Aided by over 400 tanks the British assault smashed through the German defences and advanced up to five miles through the much vaunted defences of the Hindenburg Line. However, the new tactics were far from perfect; many tanks were destroyed by German field guns firing over open sights and what to do after gaining initial success was still a mystery. Over the next two weeks the Germans counter-attacked and regained most of the ground lost on the first day. On 30 November the 1st Battalion of the King’s was in the firing line, which was, by then, the old German support trench only a few hundred yards from their pre-battle front line. Persistent German attacks through that day and the next saw heavy casualties on both sides. The battalion war diary describes the day’s desperate fighting at length; too much length to be incorporated into this account (see Appendix for full entry). It tells of a battalion under great pressure, fighting with bayonet and bomb (grenade) to maintain its grasp of a cluster of trenches. Throughout the day more men are thrown into the action with companies of several other battalions being sent forward to reinforce the King’s while, on the other side, more and more German units join the fray. Albert was one of 43 men of the 1st Battalion, King’s to be killed in action that day. His remains were never identified so, while he may lie under one of the thousands of graves marked A Soldier of the Great War, Known Unto God, his name is remembered on panel 4 of the Cambrai Memorial outside the village of Louveral. Locally he is remembered on Tablet 10 of the Newbury Town War Memorial and on the parish memorial board and roll of honour in St Nicolas’ Church. 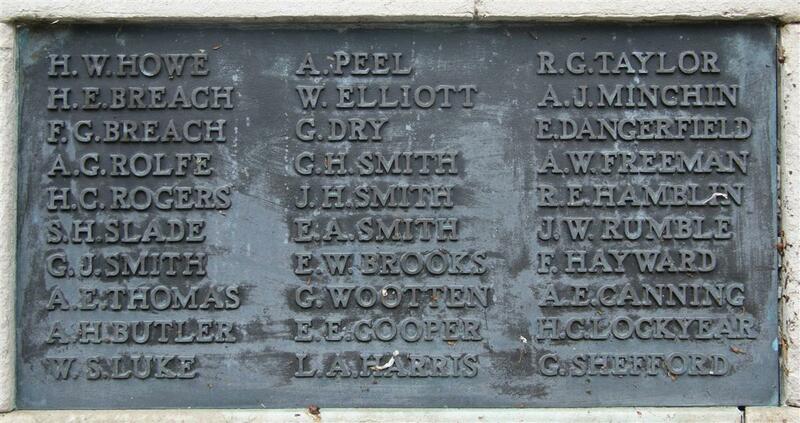 He is also remembered on the town war memorial in Whitchurch, Shropshire, where he had lived since his marriage in 1914 and where his widow, Gladys remained and raised their sons. This is a transcription of the lengthy entry in the war diary covering the day of Albert’s death. Its many grammatical errors and occasional gobbledygook have been left ‘as is’. Despite these failings it paints a better picture than most such entries of the desperate fighting on that day. Its quality can be seen from the number of times it has been rewritten or summarised in histories covering the Battle of Cambrai. The action took place in the southern part of the village of Moeuvres. Various map references are given (eg E.19.b) these refer to the maps in use at the time, specifically to Sheet 57 – see How to read a British Trench Map. A map of the area, printed in October 1917, can be viewed online here, sadly the specific trenches mentioned are not named on the map. 8.50am Enemy were reported to be massing in E.2.d. The Battalion “Stood to”. 9.30am It was reported both by Brigade & by C Coy [Company] (Right front) that the enemy were advancing Southwards from QUARRY WOOD. C Coy reported that they had opened fire on them. D Coy was ordered to send two platoons to reinforce C Coy & two platoons A Coy MIDDLESEX were ordered to move up in their place. 9.45am OC C Coy reported that the attack on the RIGHT had been broken up & this was confirmed by observation from BHQ [Battalion Headquarters] and guns were asked to slow down. 9.50am A Coy (Support) reported enemy to be advancing on our left SOS was sent up and all Companies notified. When the enemy were seen to be massing in the village OC [Officer Commanding] B Coy (LEFT FRONT) brought his 4th (Support) platoon. When our barrage came down it was reported to have been falling short on ur left & to have knocked out the bulk of two Lewis Gun teams. The enemy shelling at this time was very heavy and a lot of ‘pineapples’ were sent over causing a number of casualties. About 10am the enemy were seen advancing on the Left in E.19.b coming forward in two extended lines. At this time there was no sight of an enemy advance on the immediate front of the Left Coy & Rifle & Lewis Gun fire was brought to bear on enemy advancing on the Queen’s Westminsters on our Left. The enemy were seen to enter the front line trench of the Westminsters & Lieut Taggart Commanding B Coy rushed down to his Left flank to arrange for the protection and formed a block. The Enemy now advanced in great numbers along the whole front of B Coy & by sheer weight of numbers succeeded in entering our line & practically wiped out the garrison. Out of 4 Officers & 125 ORs [Other Ranks] only 2 Officers & 2 dozen men succeeded in getting back to our SUPPORT TRENCH down DONNER WEG, being pushed back by a large bombing party. The enemy were held up near the bottom of the CT [communication trench] and a bombing party under SGT WOODS then started to bomb them back up the trench & eventually succeeded after severe fighting in driving back up the trench to within 50 yards of its junction with the front line where a block was formed && held against many attacks throughout that day and the following by Bombers & Rifle Grenadiers, the enemy attack down this CT had failed, a Coy of the enemy attacked across the open between DONNER WEG and EDDA WEG the attack was interfered with by wire chiefly old Boche wire and the whole Coy was practically wiped out by Rifle & Lewis Gun fire. A number of the Enemy however got down into shell holes & started sniping, without waiting for orders a number of men got out over the top and disposed of these men by bomb & bayonet. The party suffered a number of casualties but most got back to our trench after disposing with the enemy. At this time about 10.20am, a heavy bombing attack developed down EDDA WEG and succeeded in getting with 50 yards of the SUPPORT LINE. A bombing party of SGT GANNON & 5 men succeeded in driving them back about 30 yards, the 5 men were killed & SGT GANNON had to retire. A strong bombing party was organised under CSM JACKSON & SGT GANNON who worked their party partly in trench & partly on top and after severe fighting succeeded in driving the enemy back & formed a block about 150yads from top of the trench, during the operation the Officer commanding the enemy party was killed & one our prisoners retaken. On this part of the front there was no further attack over the open but enemy made several heavy bombing attacks down the two CTs throughout the day, all of which were repulsed with heavy losses (casualties). At 9.45am the enemy barrage came more intense especially on the three isolated posts on the Left between the two sunken roads and behind the SUNKEN ROAD held by right half of Coy. Only the LEFT hand of the 3 isolated posts was held by day & no man escaped from the post. The enemy appear however to have rushed it close on top of the barrage. At the same time a party of the enemy appeared on the Sunken Road where the railway crosses the road at E.20.b.2.1 these were at once engaged by Lewis Gun & Rifle fire at the same time a large party of the enemy attacked the SUNKEN ROAD from the rear, having worked round the left flank. Our casualties were very severe and 2/Lieut Scott, the only Coy officer left, withdrew the survivors about a dozen, into a trench running back from the rear of SUNKEN ROAD & tried to hold up the enemy working round from the LEFT, they were again outflanked however & forced to retire down CT leading back from EAST END of SUNKEN ROAD. On reaching the bank across ERNST WEG at E.20.d.30.25 they lined the bank & for some time succeeded in holding up the enemy, the Stokes Gun at this point giving valuable assistance. Very heavy casualties were inflicted on the enemy by Lewis Gun & Rifle fire as they tried to cross the embankment at E.20.9.0.7. The enemy succeeded however in mounting a MG at the place & caused heavy casualties, he succeeded too under cover of this MG fire in working down the trench & eventually succeeded in driving back 2/Lt Scott’s party which retired down the B Line (CT) fighting. They then came up ELSA WEG & joined the party which was forming the defensive flank facing EAST in the main CT leading back from BHQ. The stand made by 2/Lt Scott with the survivors of C Coy at the bank across ERNST WEG undoubtedly gained valuable time during which supports were brought up. Having broken the front line the enemy came down the SUNKEN ROAD leading just close to Bn HQ. And down the trenches to the East of this & at 10.50am appeared in large numbers to the N&E of BHQ. The whole of BHQ were turned out & a carrying party of DCLIs were also taken to help in repelling the attack. The enemy succeeded in getting into the ruined factory building & down the SUNKEN ROAD below it for a distance of about 200 yards. After about ¾ hours hard fighting in the immediate vicinity of BHQs the enemy were driven off having suffered very heavy casualties. About 12 noon A Coy of the 17th MIDDLESEX under Lieut NUN came up in SUPPORT & bombed the enemy back along ERNST WEG as far as E.20.d.2.3 where a block was formed. About 2.0pm Lieut NETHERCOTE and about 40 men of C Coy ESSEX attempted to bomb up CT leading from block held by MIDDLESEX this attack was however held up. About 4pm C Coy MIDDLESEX took over new front line from BHQ to EDDA WEG the remainder of the KING’S closing into the LEFT. B Coy of the MIDDLESEX worked up CT on WEST of the CANAL to cover the Right flank & by 5.0pm were in touch with A Coy of the MIDDLESEX at bank at E.20.d.3.2. During these bombing operations very heavy casualties were inflicted on the enemy. Lieut J A ARMSTRONG, KING’S greatly assisted the advance of A Coy MIDDLESEX by mounting a Lewis Gun in a commanding position in RUINED FACTORY by BHQ, he succeeded in putting out of action an enemy light MG which was captured by the MIDDLESEX. This enemy MG was responsible for a great many of the casualties during the fighting by BHQ. About 5.0pm CAPT PRITCHARD with A Coy S STAFFS came up in SUPPORT & was sent along ERNST WEG with orders to take command of all troops in that area & to try and bomb up to and occupy CLOSE SUPPORT TRENCH behind SUNKEN ROAD in E.20.d. B Coy MIDDLESEX succeeded in reaching E.20.d.50.35 where they formed a block. A Coy S STAFFS succeeded in reaching trench folk [fork?] at E.20.d.2.4 where a block was formed in spite of determined attempts & STOKES co-operation no further progress was possible and severe casualties were suffered. About 7.0pm orders were received from Colonel ALBAN for an attack on LOCK 5 in co-operation with ESSEX on EAST side of CANAL. With a view relieving D Coy of the ESSEX. Orders were eventually modified & relief of the ESSEX given as sole object. Lieut A ARMSTRONG with about 20 ORs was sent as reinforcement to Capt PRICTHARD and a determined effort was made to force a way up the two CTs beyond the blocks. A very strong resistance however was met and after severe fighting in which heavy casualties were suffered the attempt had to be given up. An attempt to bomb up EDDA WEG at the same time proved unsuccessful. Nothing further of importance. D M Murray-Lyon, Lt-Col Commdg 1st Bn King’s Regt. During the night of the 30th/Dec 1st with the exception of the fighting on the RIGHT with the object of relieving D Coy ESSEX, there was no heavy fighting except at 4.45am when a strong bombing qttack developed in EDDA WEG, this was repulsed by CSM JACKSON and a party of C Coy MIDDLESEX. At 5.50am A Coy & 40 Ors of D Coy 2/HLI [2nd Bn Highland Light Infantry] reported at BHQ. The LEFT SECTOR having been re-organised & details of the KING’S having side slipped to the LEFT A Coy 2/HLI relieved C Coy of the MIDDLESEX in the RIGHT HALF of the LEFT SECTOR: C Coy MIDDLESEX & D Coy 2/HLI went into close support. At 9.35am word was received that the enemy was forming up in E.15.a & b. Companies stood to but there was no immediate development. About 11am about 3 Companies of the enemy were seen crossing the BANK near BRIDGE South of LOCK 5. They succeeded in driving back B Coy MIDDLESEX on our extreme RIGHT and penetrated into the valley in E.20.d & E.26.b and worked westwards along ELSA WEG. This attack was well supported by Machine fire from LOCK 5 & a Light Machine Gun which was established in the vicinity of ELSA WEG, which swept the parapet of the Main CT by BHQ causing a number of casualties. These enemy Machine Guns were engaged by 2 Lewis Guns of the KING’S & HLI and one captured German Light Gun fired by 2/Lieut J A ARMSTRONG, KING’S Regt. The Light Machine Gun in vicinity of ELSA WEG continued to bring a heavy fire to bear on the Junction of ELSA WEG and Main CT & parapet to the North. Capt HARRISON, 6th TMB’s [Trench Mortar Battery] by this time had rushed down a STOKES to Junction of ELSA WEG and Main CT at this time there were only 10 rounds of STOKES ammunition left, but by his rapid and accurate fire he completely demoralised the enemy and silenced the Light MG. The enemy at once began to retire and were engaged by Rifle and Lewis Gun fire suffering very heavy casualties & few, if any, getting back to the bridge near LOCK 5. One party of 15 who were caught in a BAY which was overlooked from our position at ELSA WEG was totally wiped out by the Lewis Gun fired by 2/Lieut J A ARMSTRONG. A gun belonging to D Coy HLI mowed down large numbers of BCHE who had got out of the trench & tried to escape over the open. At 3.18pm enemy put down a heavy barrage right along our front line and were reported to be massing in MOEUVRES. In answer to our SOS our guns put down a very effective barrage, the Machine Gun barrage however was late in opening. The enemy were seen to advance on our RIGHT and LEFT and were engaged by our Lewis Gun and Rifle fire and advance checked. On our front the attack never developed, having undoubtedly been broken up by our barrage, which was very heavy and well placed. The enemy barrage gradually slackened and ceased altogether about 5pm it had caused a number of casualties and done considerable damage to the trench. During this enemy barrage five enemy planes flew backwards and forwards very low over where the enemy were believed to be, a great number of green and other coloured lights were also fired at this time. Nothing further of importance happened and the Bn was relieved by the 2nd HLI relief being complete by 3.30am Dec 2nd 1917. 2nd Lt C H BROADHURST died of wounds on the 1st. Total casualties were given in last month’s diary. Bn moved to SLAG HEAP behind LOCK 7 in RESERVE. Casualties were not ‘given in last month’s diary’ – the Commonwealth War Graves Commission records the death of 43 soldiers from the battalion on 30 November and 19 on 1 December. In general deaths were only a fraction of the losses, many more would be wounded and put out of action; some for a few days, some forever. There are also reports of some men being taken prisoner when the Germans got behind their positions – this is not reported in the diary. Diaries tend to be written in a manner that would reflect well on the unit; losing men as prisoners was not considered ‘good form’.